The Kindest Man Alive: Jon Hamm Guarded This Nest Of Orphaned Snake Eggs For 3 Months! Good looks, talent, fame, money: Would you set them all aside to do what’s right? Jon Hamm did when he recently spent three months protecting a nest of California kingsnake eggs, once again proving that he’s one hell of a guy. The Mad Men star was hiking in the Ojai Valley when he came upon a clutch of eggs in a hollow log. Knowing defenseless eggs make a tasty treat for wild rats and weasels, Hamm made it his business to hunker down and keep an eye on the nest. But when two days passed and no mother returned, he and his good heart were in it for the long haul. For the next three months, Hamm kept the eggs safe and sound: lobbing grubs and berries to distract curious birds, gently shooing away snooping rodents, even hollering and howling to spook a black bear who’d lumbered too close. When it rained, Jon Hamm would selflessly shield the eggs with his body, and on frigid nights, he’d even hold them to his chest and murmur lullabies. Of course, this was no cakewalk for Hamm, who survived on only what he could forage within view of the nest and trained himself to sleep with one eye open. In the days before the eggs hatched, he was even down to sucking on stones to keep his thirst at bay. But that’s just the kind of guy he is. And thanks to Jon Hamm, hatch the snakes did, healthy and hissing. His duty fulfilled, he walked on down the road, looking rugged behind a brand-new beard. While his good deed pushed back filming on Mad Men’s final season, costing AMC millions of dollars, these beautiful little guys now have a shot at life! 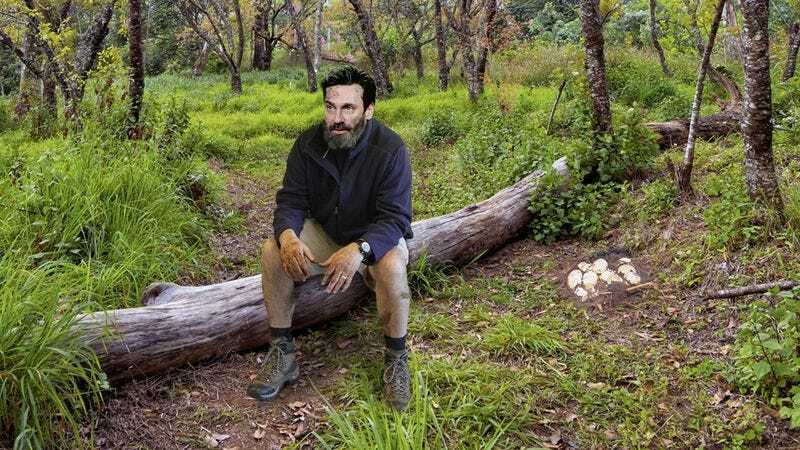 There’s no doubt in our minds: The animal kingdom has a true friend in Jon Hamm, the kindest man alive.